Hillary Clinton: No Ceilings: worldwide full equal education for girls. John Kasich: I like the ideas in Common Core, but not the program. John Kasich: We need charter schools, with state oversight. Scott Walker: Support virtual schools and homeschooling. James Webb: More pre-K programs; more second-chance high schools. James Webb: Rebuild our public educational system. Bobby Jindal: Let parents decide on traditional school or virtual school. Chris Christie: Focus on college readiness; expand use of apprenticeships. Donald Trump: We spend more per student than any other nation. Jeb Bush: Parental choice in preschool, both public and private. Jeb Bush: Class-size reduction does not improve student achievement. Jeb Bush: Minority achievement gap intolerable morally & economically. Rick Perry: Get rid of the federal Department of Education. Rick Perry: We implemented $10,000 degrees at 13 Texas universities. Lincoln Chafee: Supports charters, STEM, and early education. Lindsey Graham: States were bribed & coerced into adopting Common Core. Lindsey Graham: I made homeschool graduates eligible for military service. Lindsey Graham: Before the 60s, we were able to say a prayer in school. Ben Carson: Supports charter schools; supports local control. Ben Carson: Supports homeschooling; supports teaching values. Carly Fiorina: Opposes Common Core; shrink Dept. of Education. Carly Fiorina: Supports competition and accountability in schools. Bernie Sanders: Do away with fill-in-the-bubble standardized tests. Bernie Sanders: Education begins before age 4 or 5. Ted Cruz: Abolish the U.S. Department of Education. Ted Cruz: The rich already have school choice; give it to the poor. Ted Cruz: Supports ending racial preferences for college admissions. Marco Rubio: No national school board; end Department of Education. Marco Rubio: Empower parents to overcome disastrous public system. Marco Rubio: Theistic evolution: science and faith are not incompatible. Hillary Clinton: Testing system based on a core curriculum has value. Hillary Clinton: Supports public school system: charters but not vouchers. Hillary Clinton: Teach discipline, self-control & patience in schools. Jeb Bush: Redesign education around tech, including Virtual Schools. 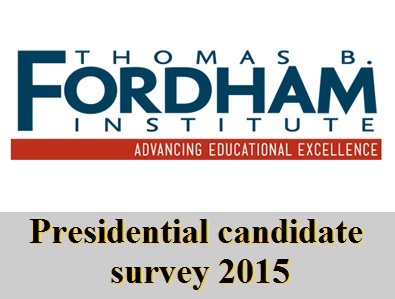 The above quotations are from Fordham Institute EduWatch 2015 by Brandon White.